John Stanley's early work on the one-shot issues of Little Lulu has been dealt a bad hand in reprints. 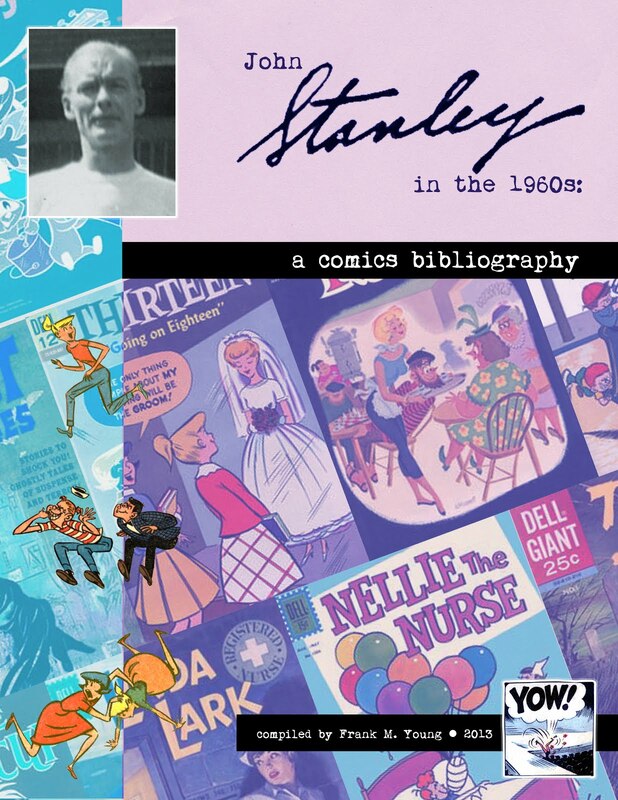 Aside from the appearance of one Stanley-drawn "Lulu" in The Smithsonian Book of Comic-Book Comics, none of these early stories--which amount to over 500 pages of story and art by Stanley--have been accurately reprinted. Thus, the reading experience of this sizable chunk of all-Stanley comix is rendered pretty moot. 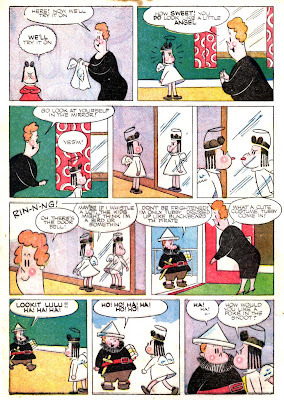 Reading these doggedly traced re-creations is like watching a colorized movie--or a movie with hard-coded Greek subtitles. Technically, it's the movie, but it isn't. 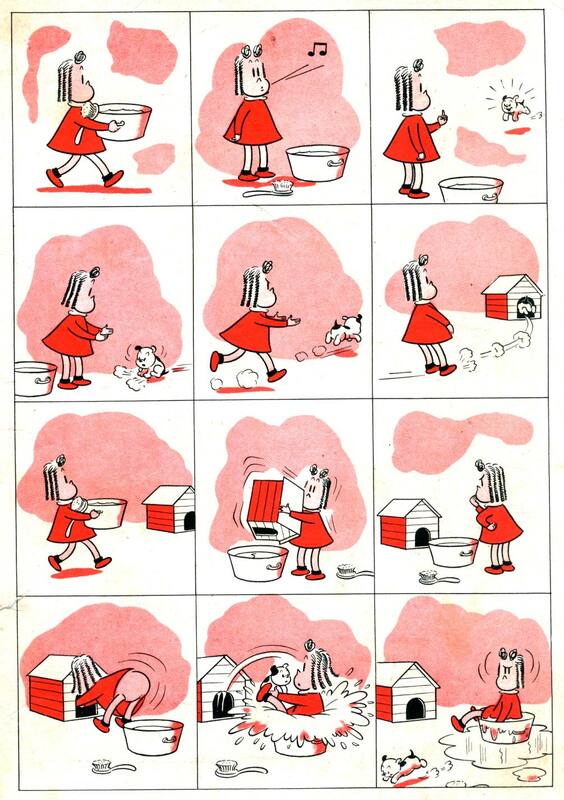 The reader is not fully immersed in the work because it's not all there. 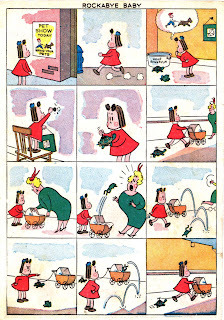 The dull, lifeless lines of the tracings leave these rowdy, vigorous stories flat and depressing on the reprinted page. Since most people (myself included!) 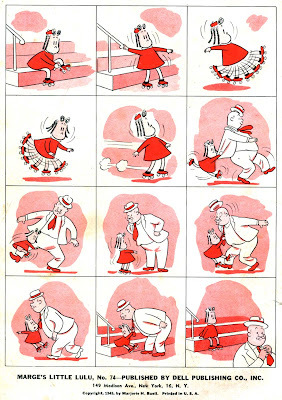 cannot afford the original 1945-47 printings of these comics, I have decided to embark on a series of more accurate presentations of this maligned and extremely important John Stanley material. 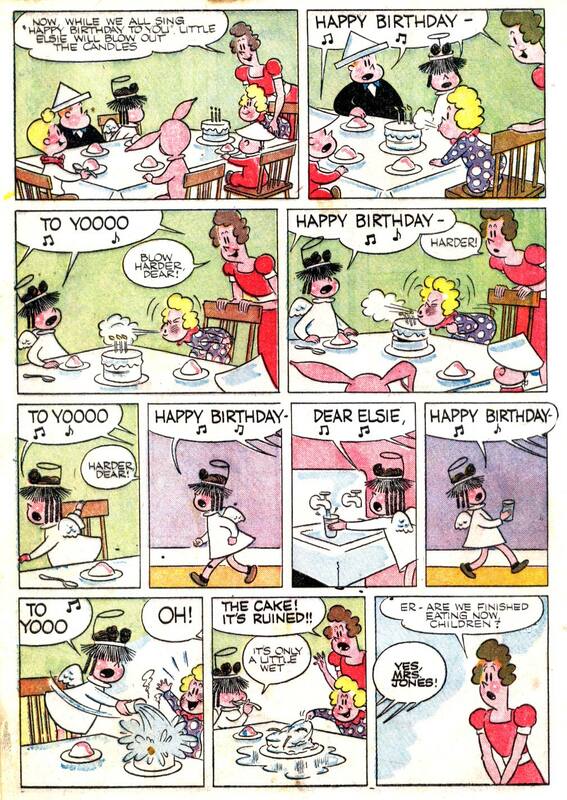 To that end, here are two stories from the first Lulu "Four-Color" book, with some one-page gags added to the mix. 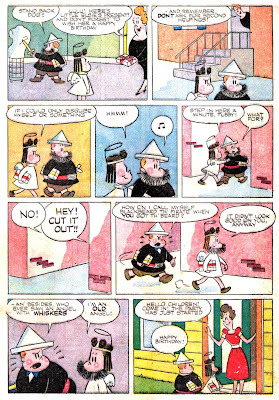 It's nice to see these in color. They were not intended to be read in black-and-white. 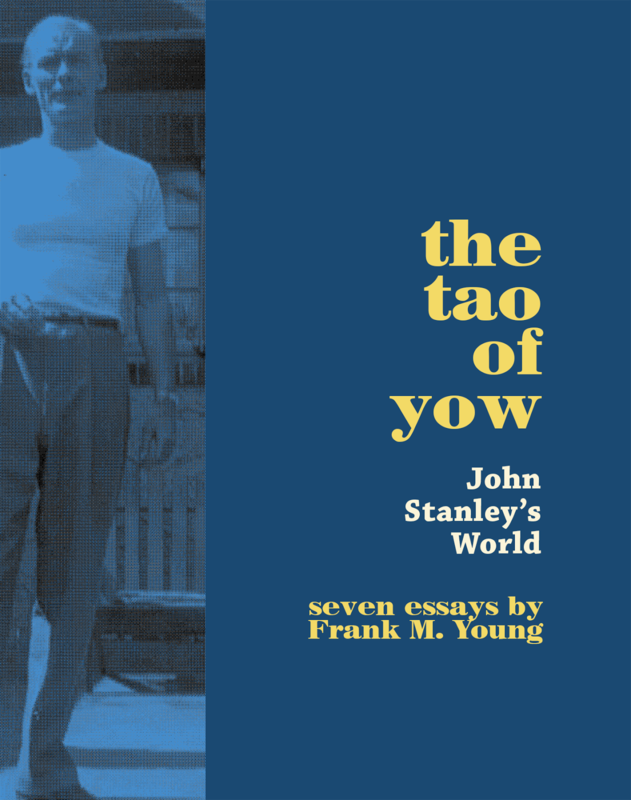 This, again, does a dis-service to Stanley's work. 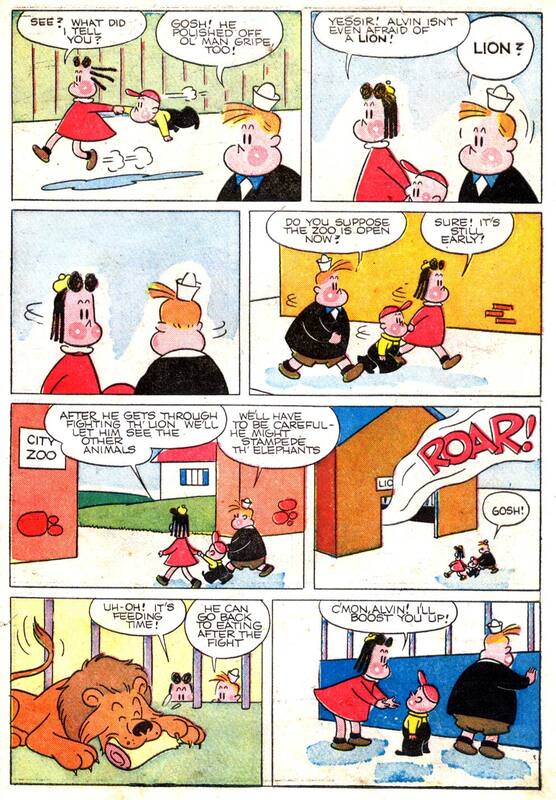 Here, for starters, is the very first "Little Lulu" story, written and drawn by Mr. S.
The rowdiness and anarchy of the kids here is striking. This story is very much of a piece with Stanley's early "Tom and Jerry" stories from Our Gang Comics (many examples of which are elsewhere on this blog). 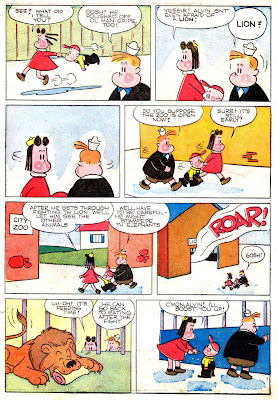 The broad, violent physical comedy, the un-punctuated sentences in speech balloons, and the SFX (including a couple glorious YOWs) are strong Stanley "tells." 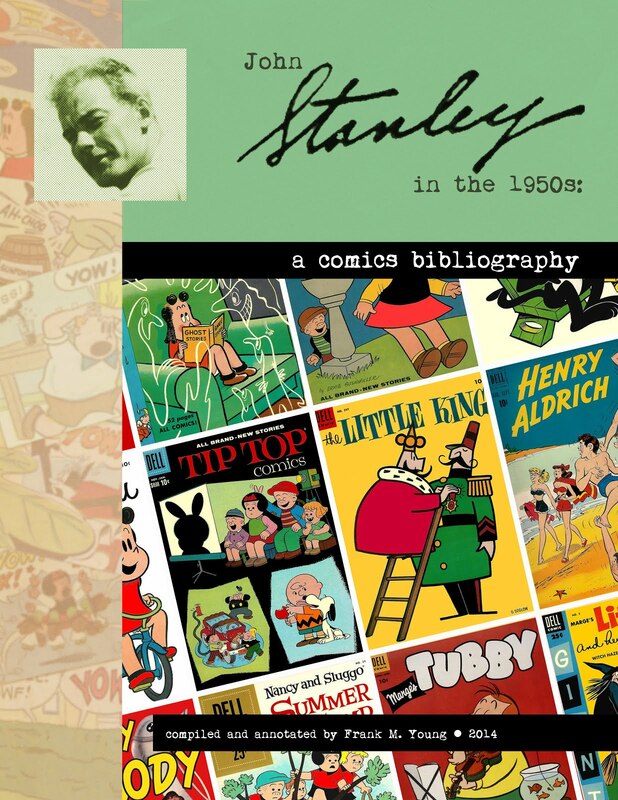 In fact, by using this artwork as a compass, I now believe that Stanley also did the finished art for at least a couple of the "Tom and Jerry" stories. 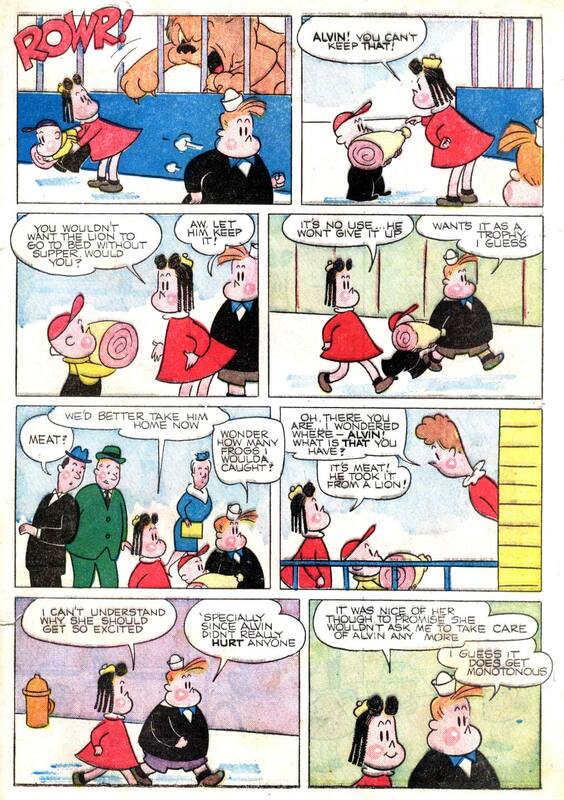 This post contains a story from Our Gang #15 that seems like 100% Stanley cartooning to me. There are possible others from around this time. 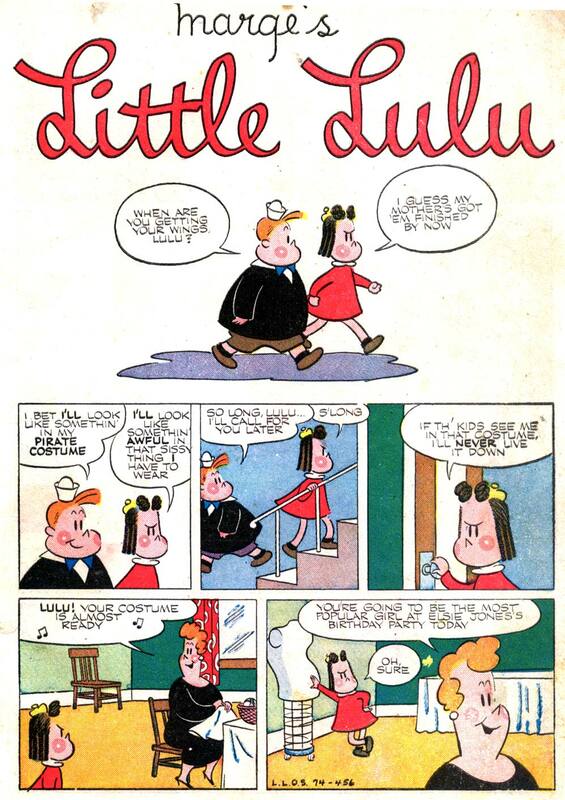 The lettering, which is clearly Stanley's own, is another "tell." He was a superb letterer, and his SFX words have a uniquely vivid pen line. 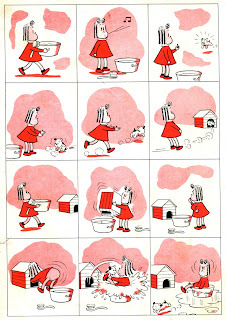 Lulu is a far cry from the Voice Of Reason goddess she would soon become. 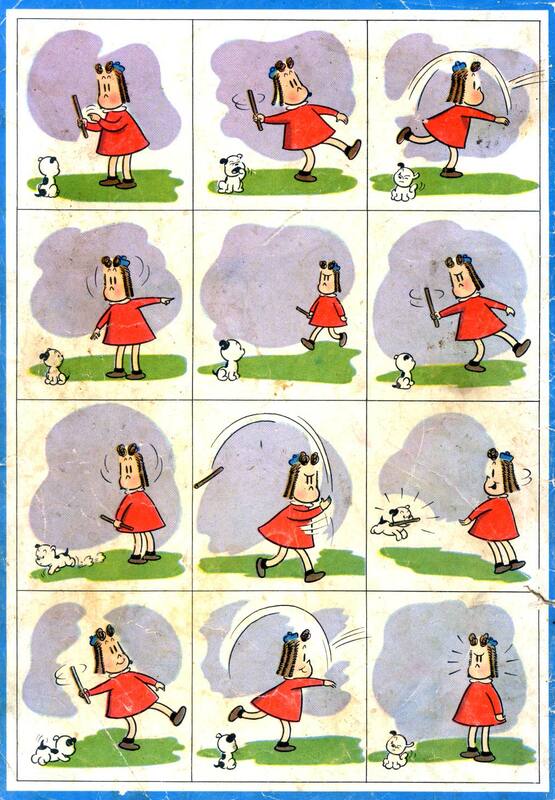 She is a stubborn, ill-tempered trouble-maker who takes her own initiative, damn the outcome. In contrast, Tubby seems meek and mild--although Stanley had already previewed the classic Tubby persona in his New Funnies work, he waited 'til the book's second story, "At the Beach" (reprinted in the Smithsonian tome, easily available at most public libraries) to endow Master Tompkins with the first of his cognitive bias-driven quirks. 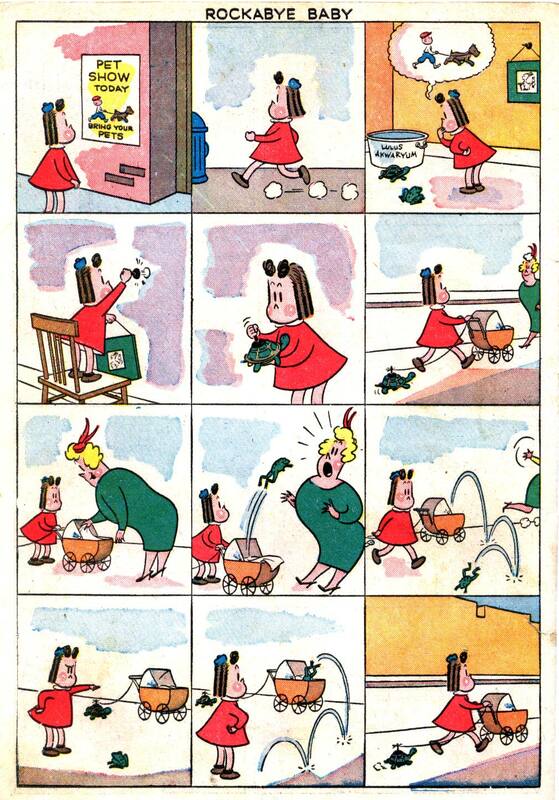 The mother's obvious fear of the children, and of their unpredictable, destructive actions, is priceless here. 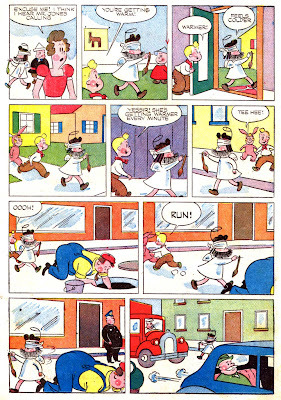 Stanley includes some pantomime sequences within the story. He did scores of wordless gag pages for the Lulu comics, but it's rare to see a showy sequence such as the one on p. 5 of this piece. 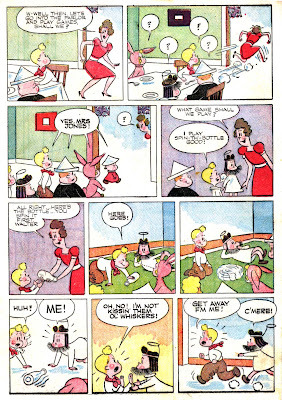 This is not the classic "Lulu" world, but it is bracing, beautifully drawn and paced suburban slapstick. 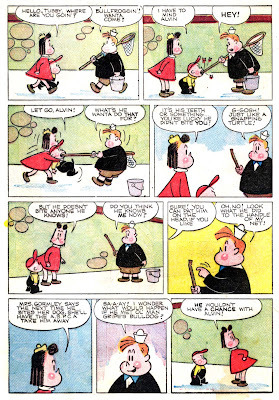 The precision of Stanley's cartooning, which often feels hurried, is striking here. 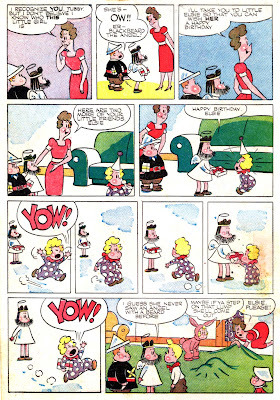 All eyes were upon him in the creation of this first "Lulu" comic-book (including those of series creator Marge Buell), and Stanley delivered the goods in both art and story. 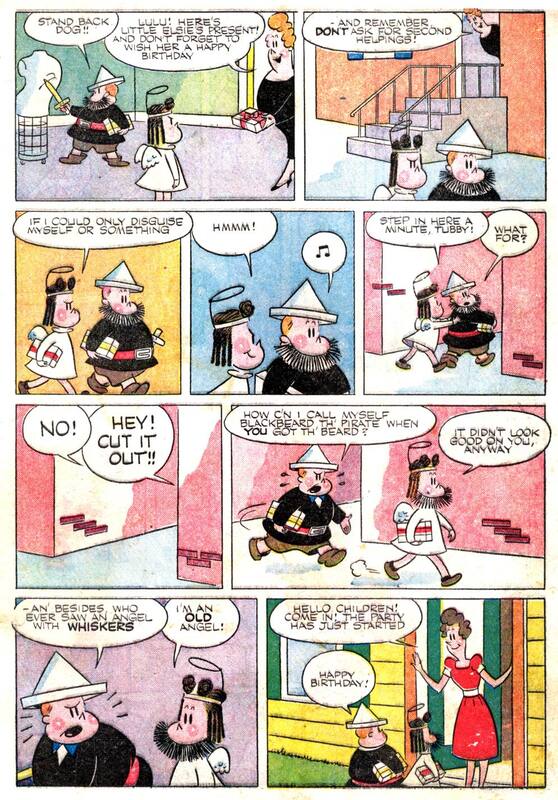 I can't imagine that drawing those poorly-designed Buell characters over and over again was much fun. Here are two pantomime gag pages. 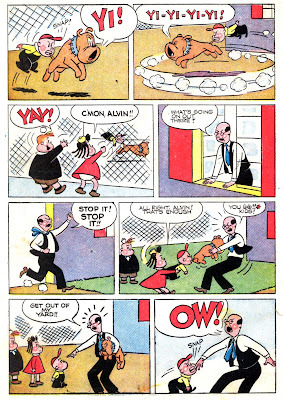 The book's third and last story introduces Alvin, the true loose cannon in the Lulu-verse. 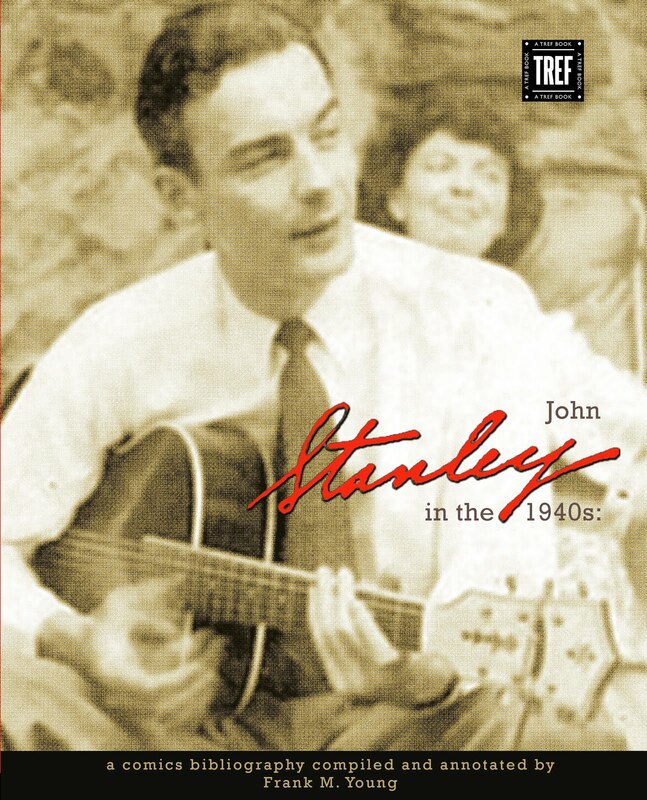 He is quite different from the character of the best-known 1950s-era stories. Once more, kiddie anarchy rules--with the children unfazed in the eye of their own hurricane. 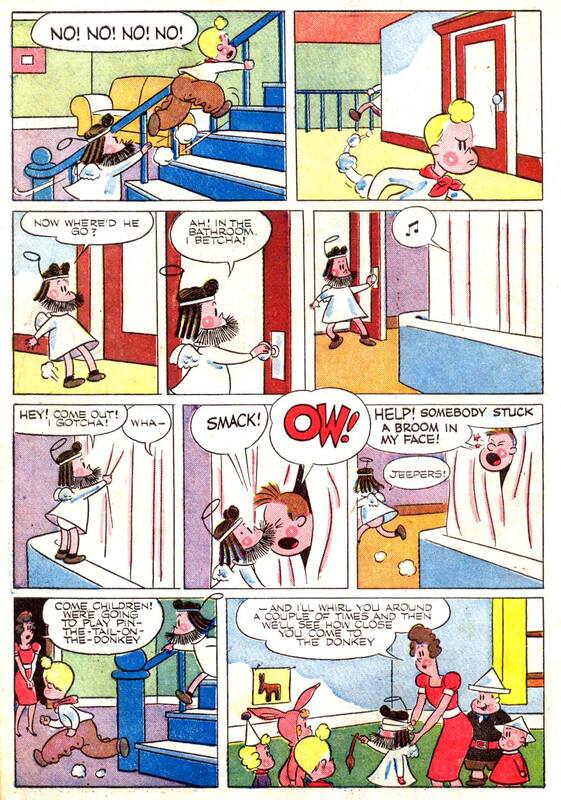 Yep, Alvin's a hellion--but, in this debut story, there are surprisingly real moments of child behavior. 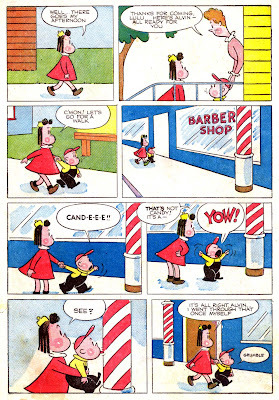 The sequence on p.2, in which Alvin just has to lick the striped barber-pole, and Lulu confesses that she, too, went through that rite of passage, is spot-on. 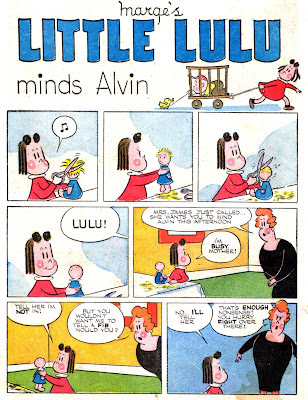 Again, the lackadaisical reaction of Lulu and Tubby to Alvin's anti-social antics (hey, there's a great comic-book title!) 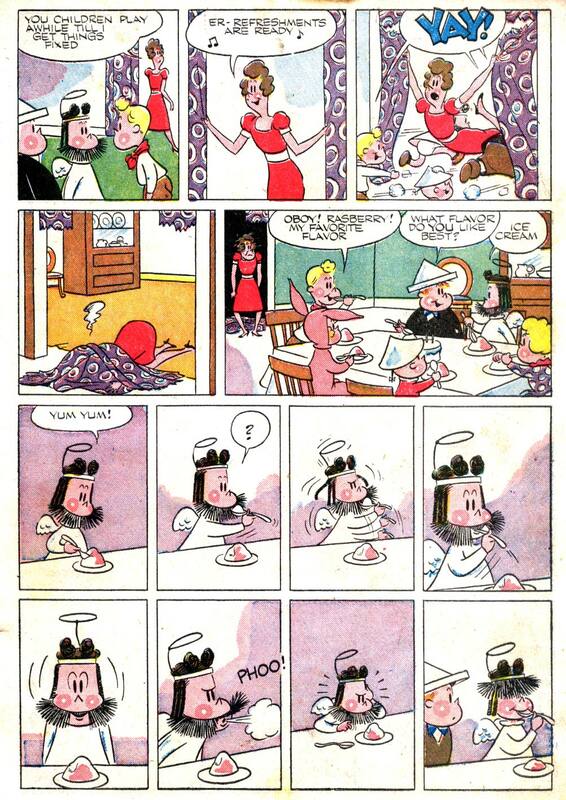 is as funny, if not funnier than, the carnage that ensues. 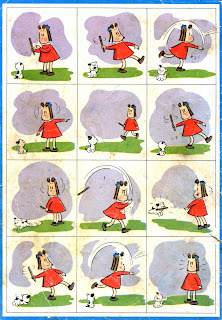 The story's opening sequence, with Lulu happily maiming her doll, is another example of how different Stanley's take on this character is at the series' outset. 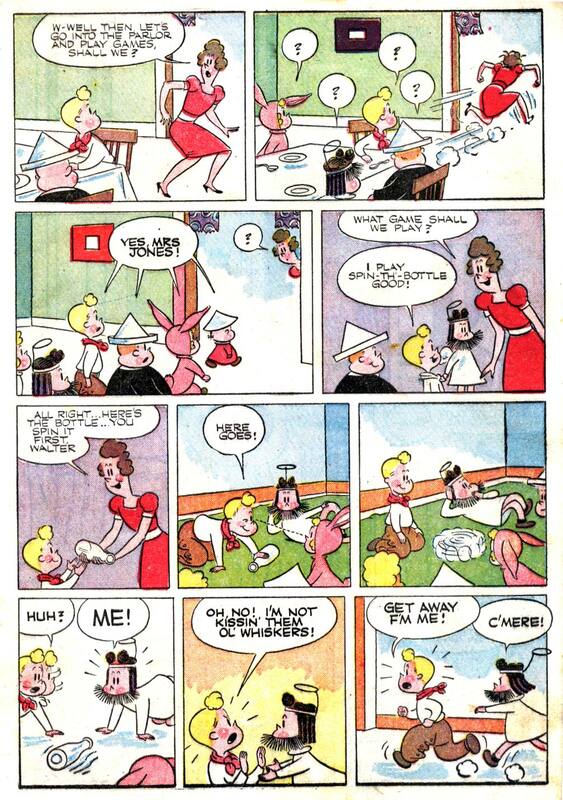 The Lulu of, say, 1951 would recoil in horror at the thought of giving one of her dolls the "Kojak" look! Yet this random behavior seems on-the-money and probable. That's why it works--it's not trying to be funny. A special shout-out goes to the innovative coloring of these stories. 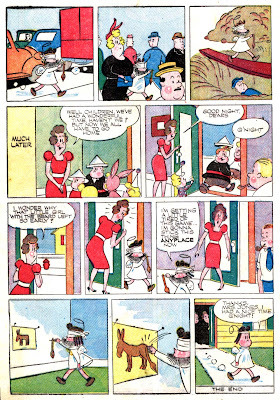 Although the achievement of magazine-cartoon wash tones was out of the question for the cruddy four-color press, the Western Publications colorist did his/her best to approximate the look and feel on the funny-book page. D'joo notice the dropping of the name "Gormley" in this story? 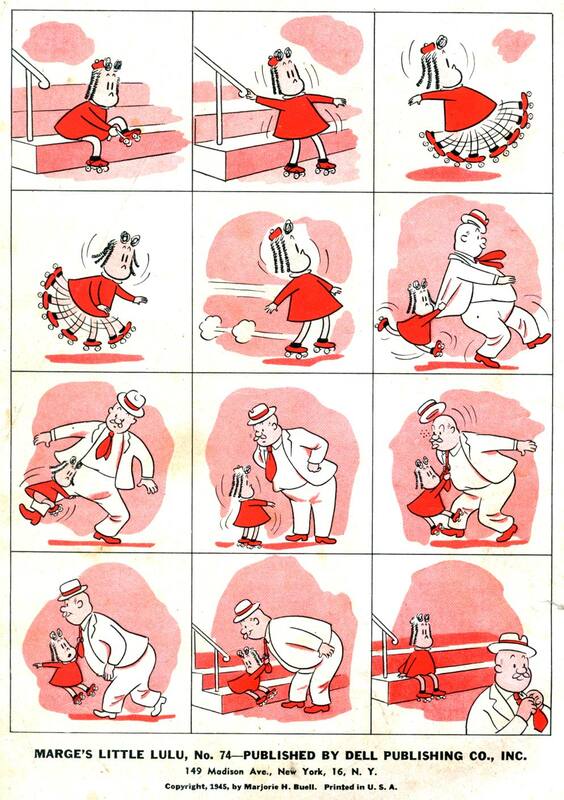 Stanley must have been quite fond of cartoonist Dan Gormley in the 1940s. 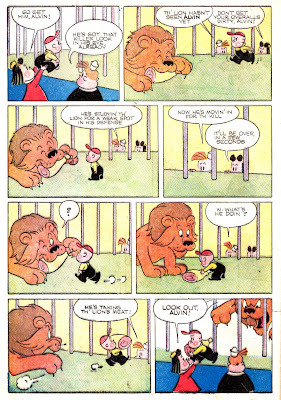 He and Walt Kelly both name-check their colleague in their comic-book work. As a chaser, here are three more gag-pages from this first issue. 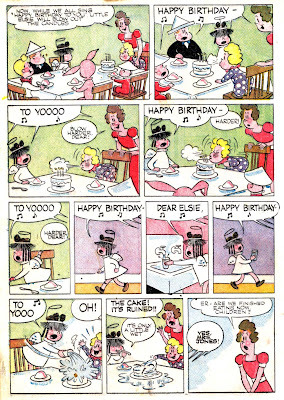 Dig that sprightly yet tidy cartooning! 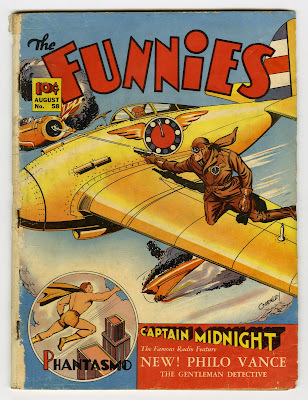 The final two gags, which ran on the book's back cover, tie in nicely with their front component. 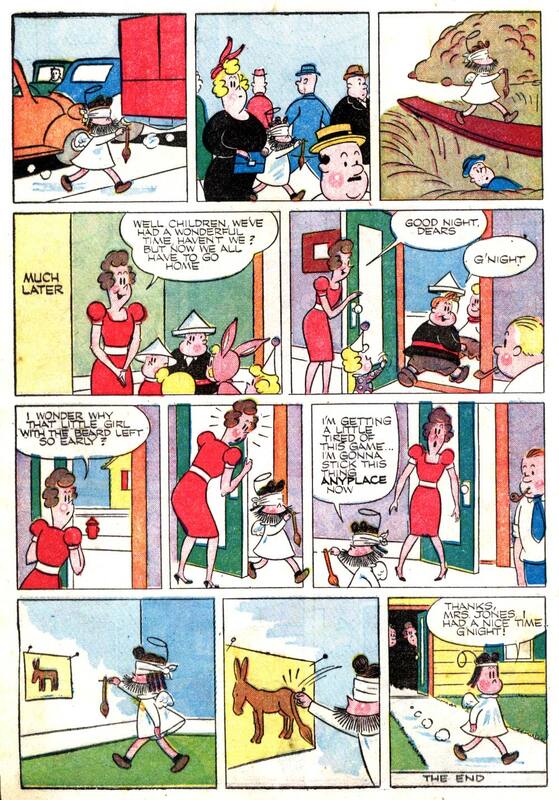 Thoughtful touches such as these make Western's 1940s comics a cut above the rest. 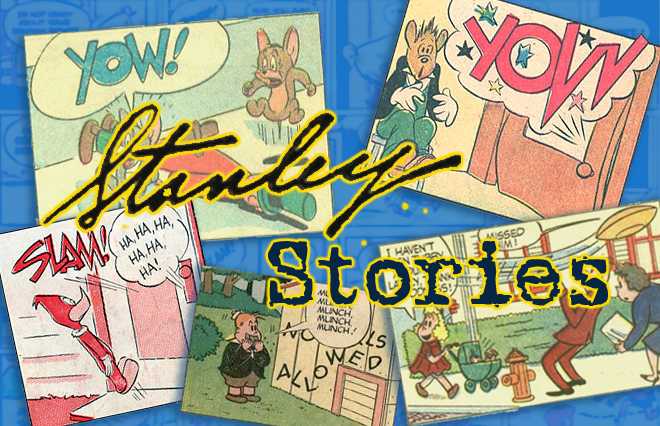 Want to see more of these Stanley-drawn "Lulu" stories? Let me know! I have enjoyed all your posts, and this is the best yet. Please do show more early Lulu stories. How synchronistic! Just 2 nights ago I pulled out and read that first story in the Dark Horse version. (I too prefer color but only have Set VI from Another Rainbow.) I confess to not noticing a problem with the art. 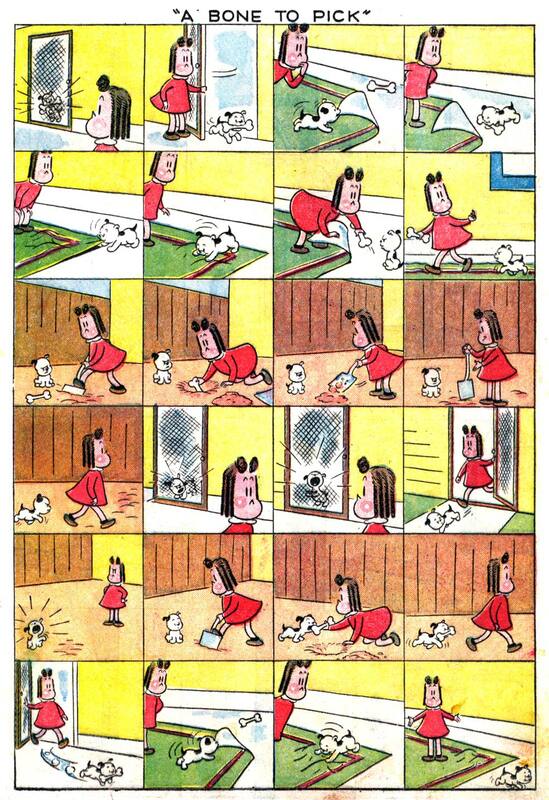 I think I filed it all under "early work." I'll have to compare your scans with the book to see what you mean. Perhaps you might do a bit more discussion on that sometime? But definitely put up more of the early stuff! Myrrpage, THANKS for catching that goof! It's been repaired. Apologies (apologies) for the echo (echo). Mmmmh... 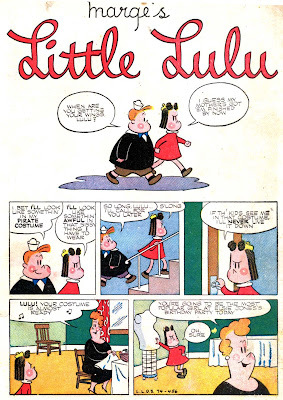 I was really considering the possibility of buying the recent Giant Size Little Lulu: v.1, but this post has made me to rethink seriously my initial intention (I know that that wasn't the purpose of this post !). 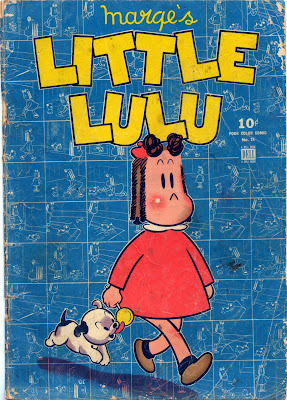 Otherwise, I'm completely agreed with your thoughts, despite I don't have any of the first issues of B/W Dark Horse Little Lulu series to compare. Thanks for speaking bluntly, my friend! Love when passion knocks down the walls of formality! Thanks for your comment. 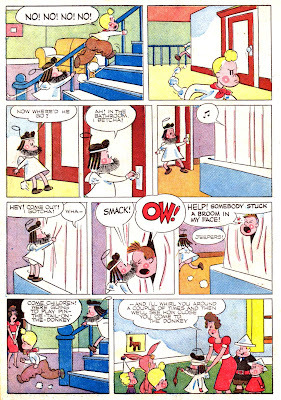 If I recall correctly, Stanley did the first couple of "Lulu" one-shots with Marge Buell closely supervising his work. She obviously understood that her characters were in good hands, and gave Stanley a lot of wiggle room. That she eventually sold the rights to the characters to Western Publishing would infer that she, ultimately, was pleased with their rendition of Lulu & Co. So, thanks for posting the original scans! I really enjoyed reading again "La pequeña Lulú" well that is how i know her, i am from Venezuela, this bring me good memories from my childhood, i used to love to read Lulu and my friends and I use to exchange these comics. 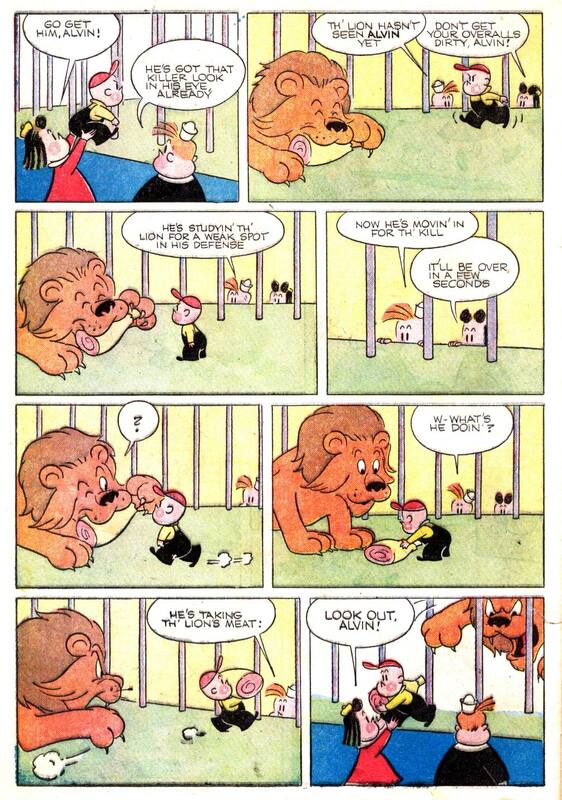 I wonder if there is a site to download these comics, i mean if that is possible. I want more, i want them all! 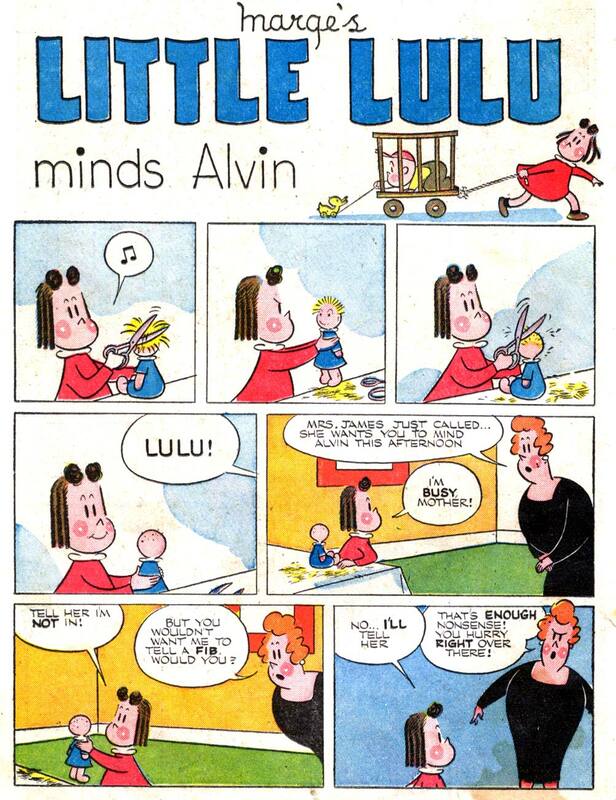 There's a story, that little Lulu tells Alvin, in which pirates are cursed for having said a bad word. The balloon with such bad word follows the pirates. Well, I read it in Portuguese, being Brazilian. The curse word was maldição. I wonder what that word was in English. Damn, maybe? 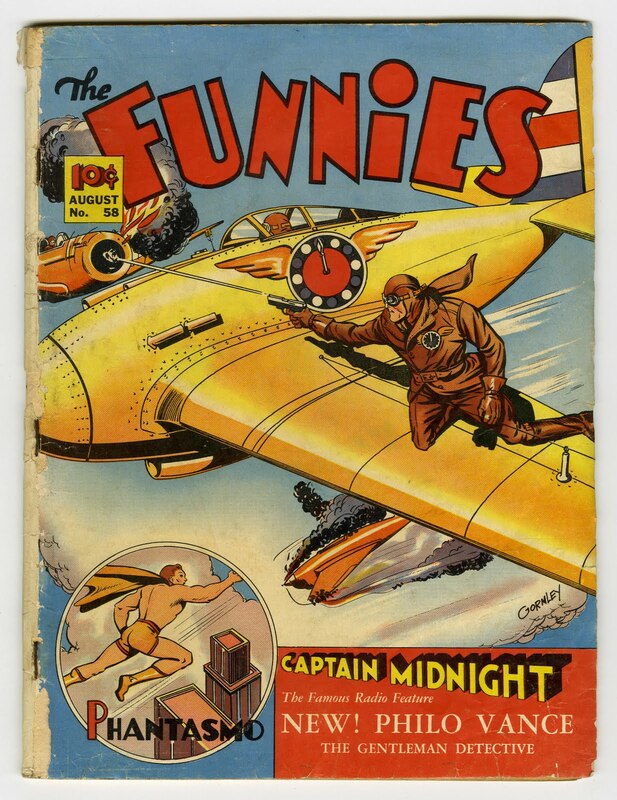 original comic books in color. Why is that so hard? 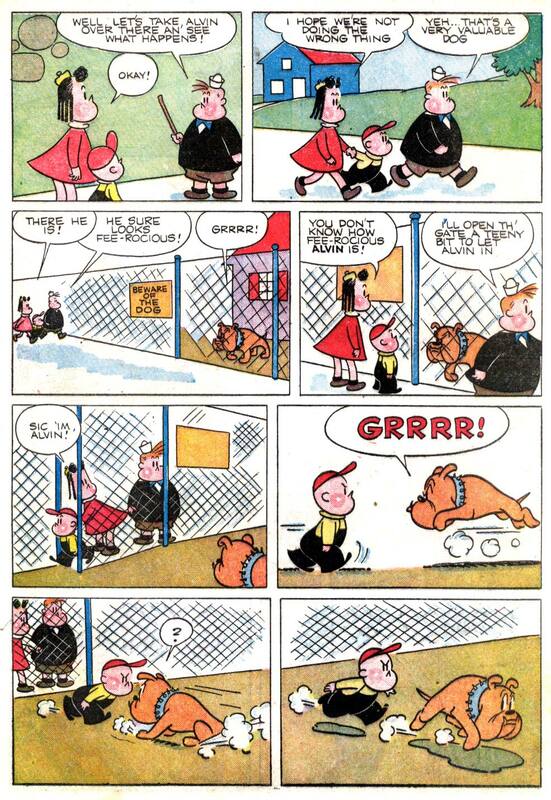 The ONLY reason to reprint in B&W would be if they had Stanley's original art. But they don't. 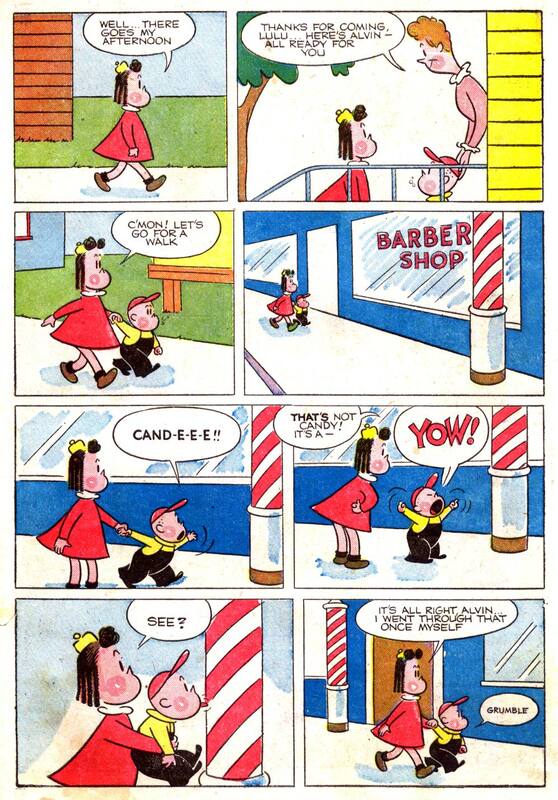 Somebody, please, just scan mint condition copies of the comics and put them in a book. This is ridiculous.